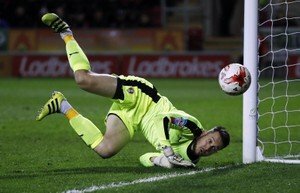 After letting goalkeeper Lewis Price leave the club at the end of last season, having made just two appearances, one of those in the Checkatrade Trophy, Rotherham United have re-signed the thirty-three year old today – subject to EFL and FA ratification. Beginning his career with Ipswich Town, Lewis joined Derby County in 2007 who he made a handful of appearances for in the three years he was there. While with the Rams Lewis had loan spells with MK Dons, Luton Town and Brentford. In 2010 the shot-stopper signed for Crystal Palace, again having more game time in loan spells with Mansfield Town and Crawley, than he did at Selhurst Park. After being released by Palace he signed a one-year deal with Sheffield Wednesday and from there moved to Rotherham in the summer of 2016. Lewis made his debut for the Millers in the League Cup in August 2016 going on to make another eighteen appearances. His only league game last season was in March away at Southend which we lost two-nil. Today, Lewis re-signed for Rotherham with a deal that keeps him at the New York Stadium until the summer of 2020. I’ve nothing against Lewis Price but I can’t help but think this smacks a bit of desperation – although, saying that giving him a two year deal Paul Warne obviously sees something in him. All at Vital Rotherham welcome Lewis back to the New York Stadium.